Jan Clancy is a Dental Hygienist with Downtown Dental Group. As a Manhattan native (born just a few blocks from the office) she loves all the staff and patients at Downtown Dental Group! Patients might not realize that Jan collects rocks, she did as a small child and now her grandchildren love them so she started to collect again. She was drawn to dentistry because she loves to see people smile and found teeth fascinating. Her favorite memory at the DDG is when everyone dressed up as Toy Story for Halloween, the extent of the costumes were amazing and she loved the comradery of the celebration. Jan’s piece of advice to her patients is that your teeth are the gateway to better health and a longer live – so brush and floss daily! Her Achilles heel are babies, puppies, and kitten – basically, anything cute makes Jan smile! As a local native, she has many ties to the community one of which is that her dad was the golf coach at K-State! 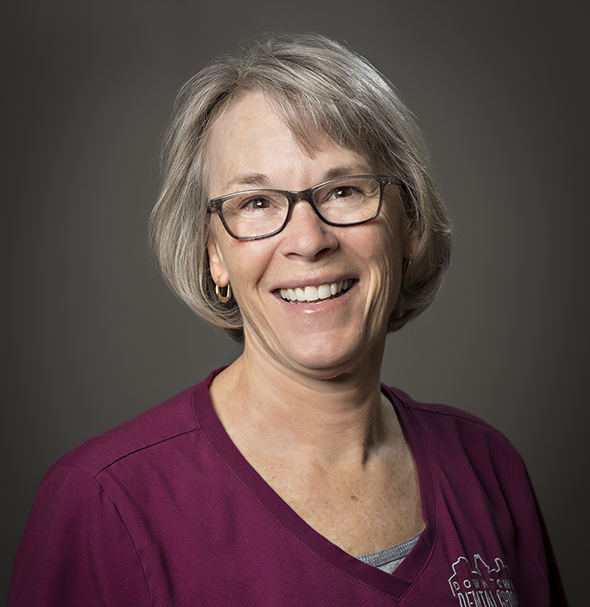 Jan brings over 38 years of experience to the Downtown Dental Group family!